With the ISC202 and ISC450 inductive conductivity analyzers, these are now problems of the past: both devices enable stable, continuous monitoring and the quick detection of sugar solution leaks, preventing serious problems from ever developing. 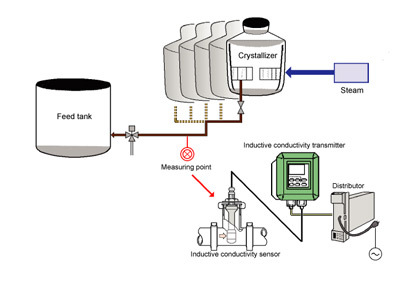 In sugar factories, crystallizers and concentrators produce a large amount of steam drain, which is reused as boiler feed water. However, sugar leaked during the boiler feed process can mix into this water. When that happens, the sugar can decompose into an organic acid at high temperatures, thereby decreasing the pH of the water. If the boiler operates with water at a low pH level, it can become corroded. The lowered pH needs to be raised to a normal level by performing a blowdown or the like, and the losses potentially caused by this process are not necessarily small. The sugar solution leak must be quickly detected before a minor problem turns into something much worse. For this reason, continuous monitoring is essential. As the contact output of the PH201G is always magnetically excited, it should be kept closed even when the power is turned off to perform maintenance. On-line measurements often present extra challenges, especially when routine maintenance is required. The PR10 is ideally suitable for applications where the sensors must be removed without interrupting or shutting down the process. Without any special tools the PR10 can be retracted safely from the process at pressures up to 5 bar (72 psi). Using the PR10 allows us to place any dissolved oxygen sensor that has a PG13.5 connenction into a retractable assembly.